Absolutely stunning and vibrant! Oh, thanks for pointing that out...going to your own garden to pick produce NEVER gets old! STUNNING PHOTOS and i love the commentary about sharing the cooking and planning. Andy sounds like a gem! And a great use for my beloved rotisserie chickens! 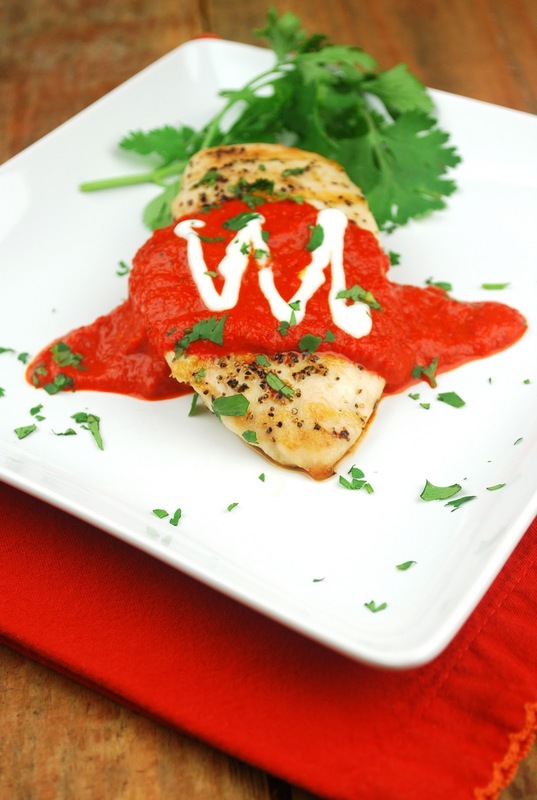 The sauce looks wonderfully red. Do you think it would work on salmon? This sauce has SUCH a nice color!!! Love this recipe for the sauce, and I think the photos look great! Whatever inspired your meal, the dish looks gorgeous! this chicken dish looks great! love your photos! Gorgeous! 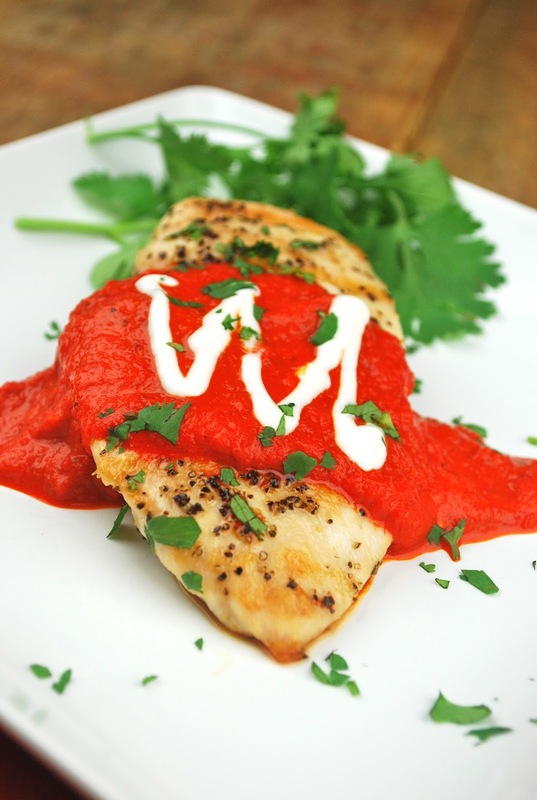 The brilliant red color of that sauce is so pretty. I don't cook with red peppers enough....I always forget how much I enjoy their flavor. 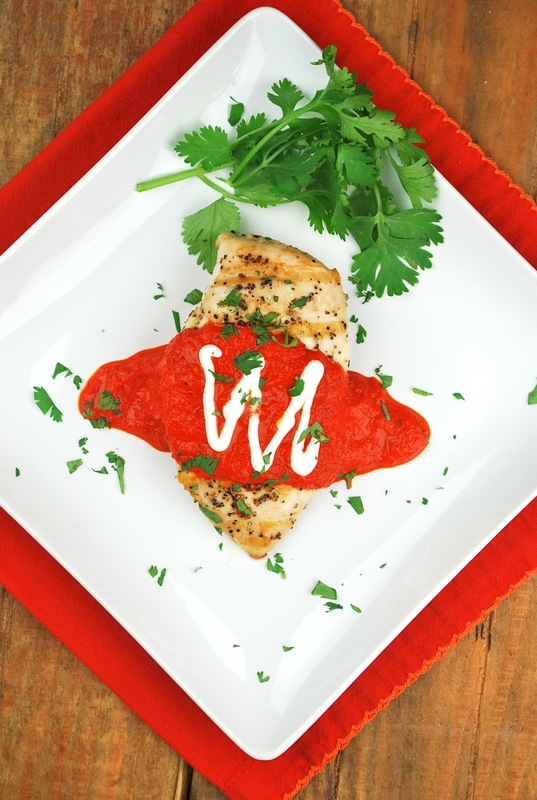 A recipe like this that showcases the sauce sounds lovely. I don't have a green thumb neither... no luck in growing my own garden... but I keep trying...maybe there's still a chance? Love the pics, they are gorgeous! I would announce to my house that I was picking stuff from my own garden too :) Great recipe, I can't wait to give it a try. I have 5 bazillion mini red peppers at home that I HAD no clue what to do with. Now I do, yea! Great pics! Beautiful Colors!!! That Andy IS A KEEPER FOR SURE!!! LOL! I want to dive right into this dish! We grow peppers too! Love picking them when there fresh. Your cat looks like mine too! Love it! 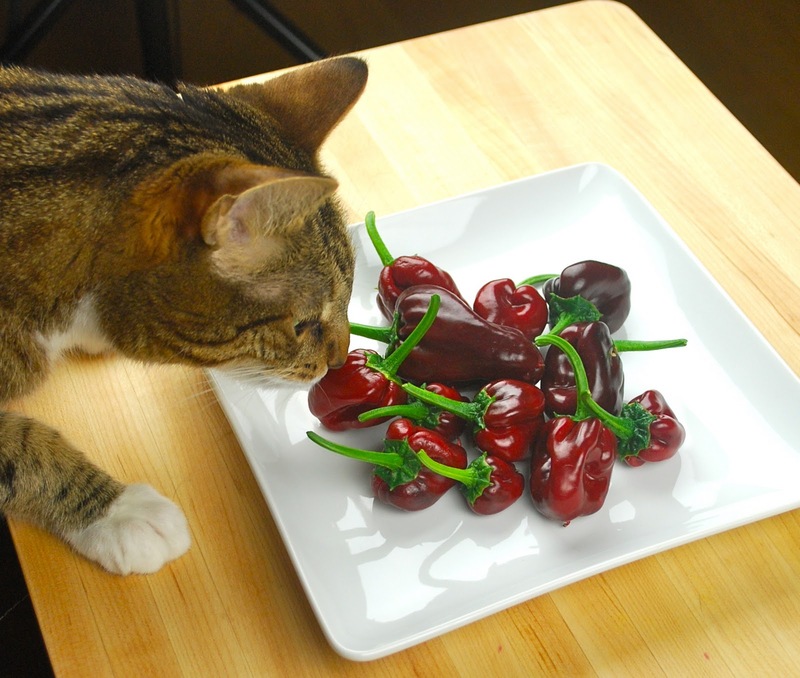 Karen, your red peppers look fabulous! I especially like the photo with your sweet kitty. And this is a chicken dish I'd love...great teamwork to come up with this! Looks delicious! love the photos. I also need a helpful comment from my husband sometimes! What a beautifully colored (and of course, flavored)sauce! And props to Andy for all those great ideas. I can't get over how perfect your peppers look--I wish I could just go out to the garden and get some like those! Lucky! What could you possibly ever need help with! I get inspired by you! Tonight I'm going to try to make this. Looks so delicious, and healthy too! We tried your Red Pepper Sauce with Sour Ceam-Lime Drizzle on halibut and it was fantastic! My husband kept repeating "This is five star!" I must say I agree. Not only is it delicious, but it is so pretty and colorful! Looking colorful and delicious. This types of recipes would be great help for the foodies and the home makers. Keep sharing these types of tips. Thanks for providing this informative and comprehensive blog. This is very interesting article. The food looks so delicious. Wow!I am amazed to read an amazing description of Food and see spectacular beauty through the fascinating pictures. I really like this blog. I really like this post. This is really amazing and interesting post. Thanks for sharing this valuable and awesome post. This is great and informative information. Thanks for sharing this useful post. Thanks for sharing nice article, nice blog! Get yourself the best-shared co-working space in Noida. In this start-up culture, everyone is opting for shared co-working space on rent as it provides them all the word class facilities but at a lower cost. All you need to pay is rent which won't cost you much. Get shared office space for rent in Noida At WorkAndNetwork at affordable prices. If you have always dreamed of MNC infrastructure but always feared the expense of it then WorkAndNetwork is the best place for you. WorkandNetwork provides shared working space on rent with world-class facilities.